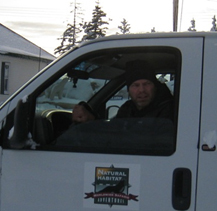 Steve has been guiding with NHA for more than a dozen years and is in charge of our outdoor activities programs, from cross-country skiing to snowshoeing. He gained his appreciation for the outdoorsas a youngster on Cape Cod where whales and other marine life abound. Steve has hiked and climbed nearly every substantial peak in the Adirondacks (as well as Mount Rainier several times – barefoot, with bricks in his pack!) and taught naturalist and wilderness skills for Outward Bound in Maine. He has produced several videos on wildlife, including an acclaimed video on the stranding of pilot whales on Cape Cod. His naturalist skills center on the unique plants encountered on our trips. Steve attended Skidmore College with Ben Bressler and tends to like to bend the elbow with Ben whenever he comes to Boulder. Career yellow cards: too numerous to list.